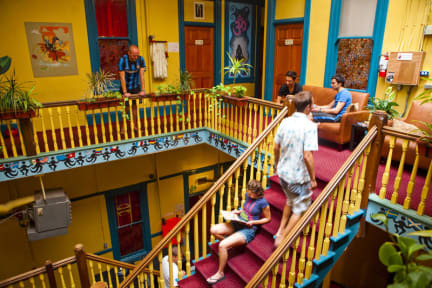 USA Hostels San Diego i San Diego, USA : Boka nu! Mycket bra hostel, ligger perfekt. Rent och snyggt, till och med personalens spellista med musik var bra. Jättemysigt! Och personalen är fantastisk. Saknade bara en balkong eller uteplats men läget är ju sådant att det inte fungerar med det. The place was really nice, the restrooms were clean and they provided soap, hair conditioner and a hair drier. Although in my opinion the toilets and showers weren’t enough: just six toilets and six showers for the whole hostel (maybe some rooms had bathrooms en suite, I don’t know). I loved that they had a vegan dinner on Sunday evening and free drinks on Saturday night. They had lots of activities and free shuttles to different places every morning. Good place to stay with many discounted activities & free stuff to do and see. Breakfast only OK (not that good as in USA Hostels Los Angeles). We stayed in a twin bed room first night, which was a room without windows. We stayed the three other nights in a private room which was uncomfortable: painted windows, carpet all the way, really unfresh smell, direct to noicy AC-box outside & if you wanted to turn the light off, the fan also stopped (if you're not 2 meters tall and can pull the string).